There’s no question that when a vehicle is in the hands of a practiced, professional driver, it provides extra safety to every person in that vehicle. 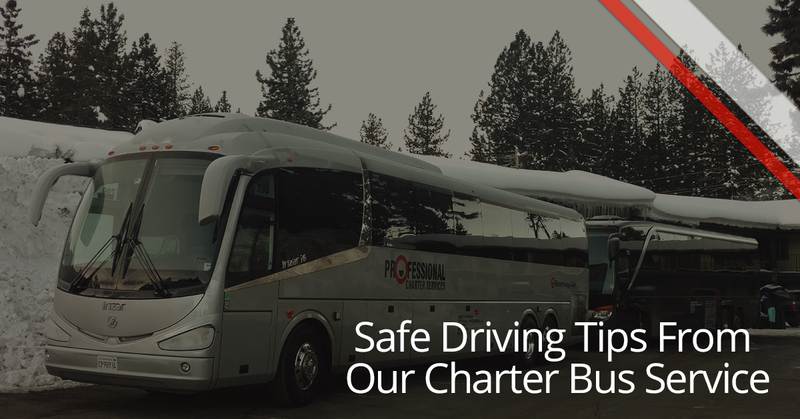 And when you get as many people into one vehicle as we do with our charter bus service, the weight of responsibility to drive safely is never far from our minds. Our precious cargo is human beings, and while transporting you on time from point A to point B should always be a priority, safety should never be sacrificed in the process. However, even when you’re driving in your own vehicle, you can practice these safe driving tips that are useful anywhere you go. No one is safe when you pull timidly onto the ramp of an interstate highway and slam on the brakes at the last minute because you’re too timid to merge into traffic. We’ve all seen drivers who have done this, and they’re putting themselves at risk by doing this. Experience and confidence will go a long way to eliminating these behaviors. No matter how good at multitasking you may think you are, the laws against texting and driving are in place for a reason. However, your mobile device isn’t the only source of potential distracted driving. Other causes of distraction could be a pet in your vehicle, being sick and sneezing frequently, eating, fishing for something that fell to the floor, crying, or even just staring at a fascinating sight out the window. We know of one woman (not one of our drivers) who went off the road because she had poison ivy and reached down to scratch her ankle. Moral of the story: Distractions can crop up where you least expect them. Be ruthless about not paying attention to any of them. Keep a safe distance between you and the vehicle in front of you. The cushion between you and the car ahead of you should get larger and larger the faster you’re going. We know that not all San Francisco drivers honor the 2-second rule, but that doesn’t mean that you should put your own safety at risk by following their example. Just this one simple principle of keeping an adequate buffer between you and the vehicle in front of you can have a huge impact on your safety, as it will give your brain time to react to any unexpected situations rather than just plowing your car straight into an accident. Take a moment to familiarize yourself with the route before you start driving. Yes, we are all spoiled by Siri, Google maps, GPS units, and step-by-step driving directions. However, if you depend exclusively on that, you can get yourself into a pickle. Sometimes the directions aren’t right. Sometimes you have to exercise your common sense. Sometimes your phone goes haywire right at the most inopportune time and you miss a turn because of it. You’d be amazed how much you can benefit by simply taking a quick look through the step-by-step directions of where you’ll be driving. We hope you’ve enjoyed these safe driving tips. However, the thing that’s better than being a safe driver is not having to drive at all. Let one of our courteous, professional drivers take you and your party to the destination where you want to go when you book your charter bus service with us. Get a quote today.